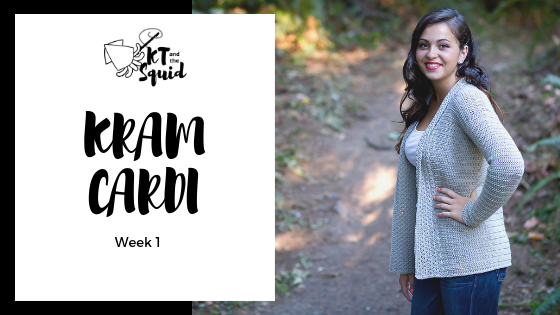 Welcome to the Kram Cardi Crochet-Along! If you are just joining us be sure to check out THIS POST first for sizing information supply list. If you’d like to purchase the Kram Cardi PDF you can do so by clicking below. This is NOT required as all the information, additional instructions and extra photos will be located on the blog. In other words, the PDF is the pattern ONLY. The PDF may come in handy if you’d like to print off the pattern without all the ads and photos. This week we finally get to play with some yarn! Are you as excited as I am!? Ok, It’s just a gauge swatch but honestly, I really like doing gauge swatches. It’s almost like a test run of things to come. Let’s start by reading all the pattern information. Please do NOT do anything yet. We just need to read so we know what’s going to happen. This Cardigan is worked in three pieces (2 sleeves and body) that are seamed together. The body is worked from the bottom up and the sleeves are worked in the round from the cuff up. Instructions for this top are written for all sizes as XS(S, M, L, 1X, 2X, 3X). When instructed to join, join with a slip stitch. Row 1: Fsc any number. Row 2: Ch 2 (does not count as a st from here on), turn, working in the FLO dc in each st across. Row 2: Ch 1, turn, working in the FLO sc in each st across. Foundation Single Crochet (Fsc): Ch 2, insert hook into the 2nd ch from hook, yarn over, pull up a loop (2 loops on hook), yarn over, pull through 1 loop on hook (this makes the ch), yarn over, pull through 2 loops on hook (completes the sc). Next Fsc: Insert hook under the 2 loops of the ch of the last st and pull up a loop, yarn over, pull through 1 loop, yarn over pull through 2 loops. Did you read? If not please go back and do so…NOW! It might seem boring and some might not make sense right now but trust me, this information may answer many questions you’ll have as we work I can not tell you how many people have asked me a question about a pattern that they could have easily answered by reading all the pattern info before starting. You ready now? Lets get started! 1 ball of your yarn (Cascade 220 Superwash). A small bowl with tepid water. Eucalan or Soak. I’ve even heard baby shampoo works well but I’ve never used it. What is gauge? Gauge is the number of stitches and rows in a set measurement. In the case of this pattern it is 16 sts by 9 rows = 4 inches. Why is gauge so important? It’s true, for some patterns gauge is not crucial but for garments it is. Without getting into too much detail basically if you get the correct gauge, you’ll end up with a cardigan that is the size it’s suppose to be. ‘I’ve heard people say, “Well, my gauge is off so I’ll just follow the instructions for size small to make a medium.” Wait…what? NO! Don’t do that! It’s so much easier and safer to just take the time to get the right gauge and follow the instructions as is. You can read a little more about it HERE. Step 1: Make a gauge swatch. Row 1: Fsc any number. How many? I did 24. I usually make mine a good 8 stitches larger than what listed in the gauge (which is 16 sts). I have a video HERE showing a foundation single crochet. When you’re done it will look like this. Don’t worry if it looks like it’s curling. That’s fine. Hate Foundation stitches? That’s ok! Feel free to ch any number and work a row of sc in the ch. HERE is a video on how to crochet in the front loop only. Row 3: Ch 1, turn, working in the FLO sc in each st across. How long do you make it? Longer than the rows listed in the gauge (9). I usually stop when I feel like I have a square. Fasten off but don’t worry about weaving in ends. Step 2: Block your swatch. Yes! We are going to block our swatch! We do this for a few reasons. Crochet tends to stretch and grow so we want to try to predict how much stretch will happen so we don’t end up with a cardigan down to our knees after it’s worn a few times. When you wash your swatch it allows your yarn to “bloom” and this will affect your gauge. Blocking your swatch is also a great test run to prepare you for blocking your finished pieces. There are a few different ways to block. Basically, you want to block your swatch the same way you plan on washing your cardigan. For this project I’ll be wet blocking which will work well for most yarns. According to the yarn label technically we could just throw the swatch in the wash but I tend to try to play it safe and be a bit more gentile with my handmade items. Plus, wool really doesn’t get too dirty so soaking the cardigan and letting it dry should be all it needs to keep clean. For more information about yarn care symbols read THIS post by Petals to Picots. If you do happen to just throw it in the wash (which is completely fine, especially for acrylics) I recommend letting the swatch hang with a few clothes pins pinned to the bottom of the swatch overnight. This will mimic the weight of a sweater and give you an idea how much it may grow. Fill your bowl with some tepid water and a small amount of your soap. A drop or two should be plenty for this (don’t over do it!). Put the swatch you just made in the water. Gently squish it around just enough to saturate the yarn completely. Let your swatch soak for about 20 minutes. If you’re like me and forget extra time wont hurt. Gently squeeze (do NOT wring) out as much water as you can. If you notice a lot of dye coming out you may want to repeat your soak again. Place the damp swatch on your towel and roll it up. Press on the towel to get as much water out as you can. You want it slightly damp but not sopping wet. Starting at the corners pin the swatch out on your board. The key here it to slightly stretch the stitches out. You don’t want to pull so much that they are completely stretched so be careful not to go overboard. Once you have the corners done fill in the sides with a pin about every inch. Yes, it seems like a lot but all this pinning gives the final fabric an amazing drape. Especially for a worsted weight yarn. Let it dry. This is the hardest part because you have to wait. Blah! I like to set a fan blowing on the swatch to help speed up the process. It could take a few hours, it could take a day. It really depends on your yarn and the humidity. Mine dried overnight. Unpin the swatch. Doesn’t that look so much better than the swatch straight off the hook? Step 3: Measure your swatch. With your tape measure or ruler (a rigid ruler is really best, I just couldn’t find it for photos) you will measure how many stitches and how many rows you have in 4 inches. There’s a few rules so don’t just measure once and call it good. You need to make sure NOT to measure the edge stitches and you need to measure in a couple places just to make sure your tension was consistent. In my photos I start at 1″ on the ruler and I’ve marked each stitch or row with a red line or dot you can actually count them (click on the photos to make them larger if you need). The hardest part for me sometimes is identifying the rows. This where measuring in a few places comes in helpful. Edited to add: Make sure you measure your swatch while it is on a FLAT surface. At this point if you have the correct number of stitches and rows in 4 inches congrats! You’re good to go. If you’re like me and like to keep really organized, label your swatch with they yarn (brand and color), hook, stitches and gauge to keep for your records. I just tie a card to the swatch. Not really necessary but I like to keep track of these things. If you are off, I’m so sorry! Unfortunately, you will have to start over with a different hook but trust me, the extra work WILL be worth it! If you have too many stitches on 4 inches try going up a hook size. If you have too few stitches try going down a hook size. If you’re still having trouble you can try switching to a different brand hook or a different material hook (aluminum, wood, plastic). Once you’ve got it, pat yourself on the back, relax and get ready for next week where we’ll get started on the bottom. This will be a lot more work than this week so prepare yourself! At the end of the crochet-along one lucky person will win 4 balls of Cascade 220 Superwash in Ridge Rock! I want to see what you made! To enter you simply have to make the Cardigan. At the end of the last post you will be given a week to upload a photo of your cardigan. On September 25th I’ll pick a winner by a random draw. Giveaway is void where prohibited.